Although this is an obvious one, allergies to pollen are quite common and can cause a great deal of discomfort. Many Americans suffer from seasonal allergies, also referred to as hay fever. Symptoms include itchy, watery eyes, stuffy or runny nose, sneezing, scratchy throat and fatigue. Different types of plants pollenate at different times of the year, depending on where you are located in the country. Most trees pollinate in the spring, but can pollinate at virtually any time of the year. Grasses pollinate in the summer, while weeds pollinate in the late summer, early fall. If you experience heightened allergy symptoms during one of these particular seasons, you are most likely allergic to the type of plant that pollinates during that time of the year. To prevent symptoms from occurring, check your local pollen counts. Pollen counts are usually higher on windy days, so be sure to take that into account. If you have prescription medicines, be sure to take those before going outdoors. For further protection, you can wear allergy masks while outdoors. For example, if you are going to be outside for an extended period of time gardening or cutting the grass, it is best to wear an allergy mask to prevent breathing in pollen particles. You should also wear sunglasses when outdoors to keep pollen out of eyes. Shower immediately after being outdoors to rinse pollen out of hair and off of skin. Most molds pollinate in the late summer and early fall, but can also grow at any time of the year. Some molds thrive in dry conditions, while others thrive in humid conditions. They can grow on damp or rotting logs, leaves, and grass. Their pollen is called spores, and as with pollen, they are easily carried by the wind. In order to keep from breathing in mold spores, you can also wear allergy masks when outdoors. However, mold spores can also enter a home through vents or through cracks in windows and doors. To eliminate mold spores from your home, place an air purifier in one of the rooms of your home, preferably the room you spend the most amount of time, such as a bedroom. Air purifiers capture allergen particles from the air and remove them, making the interior atmosphere breathable and allergy free. It is possible to be allergic to exposure to the sun, but individuals can also be allergic to the chemicals found in most sunscreens. To be sure you don’t have an allergic reaction while enjoying your time in the sun, you can use chemical-free sunscreen. The chemicals in which people are typically allergic to, or product skin reactions, found in sunscreen are benzophenone, octocrylene, PABA, and cinnamates. Chemical-free sunscreens do not contain any of these chemicals but will protect skin against sun the same way other sunscreens do. 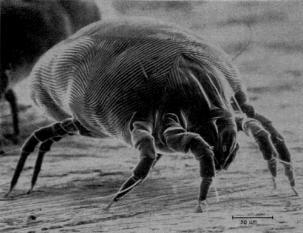 The summertime is the ideal time for dust mites because they thrive in humid environments. They live within bedding, in carpets, on furniture, and in the fabrics of clothing. They feed off of dead skin particles from humans. Humans are allergic to the waste that they produce, causing symptoms similar to seasonal allergies (sneezing, runny or stuffy nose, itchy eyes, fatigue, etc.) To get rid of dust mites you need to frequently wash clothing, bedding, and other washable items in hot water. Or, you could use allergy-free bedding the keeps dust mites from entering, along with other allergens, such as pet dander, pollen, and more. Allergy-free bedding is woven tightly to keep allergens out for healthy sleeping. Germs are not an allergen, but many people associate colder weather with getting sick from germs and bacteria. Germs and bacteria can also thrive during the summer in warmer conditions. You should be especially careful when attending picnics or cookouts. Make sure that the meat you are eating has been thoroughly cooked so that there is no bacteria found inside. Also, be careful when eating foods that have been sitting out in the sun all day, especially if they are supposed to be kept cool. When consuming these germs and bacteria, people can get food poisoning. Also, remember to keep sanitary and wash your hands often. Just because it’s summertime, doesn’t mean you won’t get sick!